This sermon was given by Pastor John Kitchen at Stow Alliance on Nov 25, 07. This time I used the printed handout for my notes and sketches. 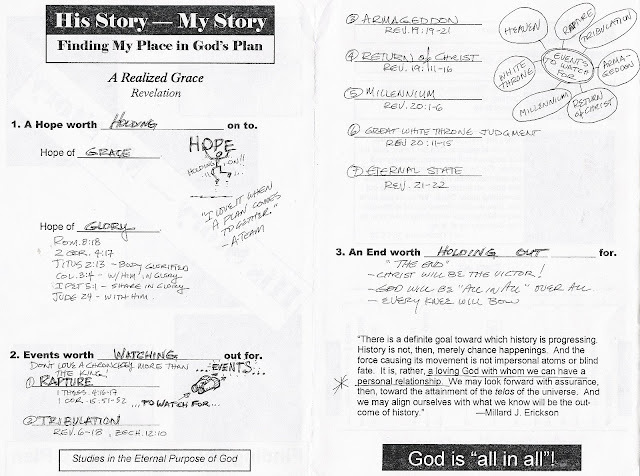 I like the little sketches by the main points - especially the one showing "A hope worth holding on to." You can click on the picture to zoom in. Sermon "notes". This was a good word. The message today was from I Samuel 27-30. 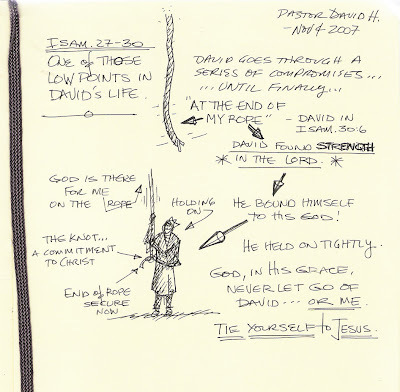 David finds himself in a pit, at the end of his rope. What does he do? He finds strength in the Lord. How? By binding himself to God. I wish I could draw people better - but I think you get the idea. David binds himself to the Rope and finds God, in his grace, is still on the other end. By "doodling" or sketching this concept from today's message I have a complete word picture that I will not forget for a long time. Try it some time. Pastor Harrop at www.bfcf.de gave this message this morning. Navigate to BFCF to hear the full message. God might give you a different visual than he did to me. Not sure what happened here. 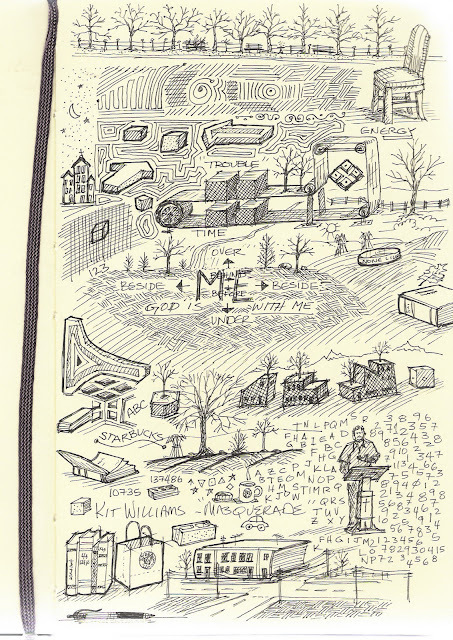 This once started out as a sermon doodle, you can see it in the middle of the page. Later, this became a page where I doodled mindlessly. I simply drew whatever came into my head. I noticed there are a bunch of little books drawn on this page. There are also a lot of trees. I like to draw winter trees - no leaves. And, as usual there is a paper shopping bag in my doodling. I guess I like the shape and fold-lines of a paper sack. I will admit that I was "inspired" to fill a page with random things after noticing something similar produced and on display by our students in their art classes. I'm still using that 0.39 gel pen. I love the fine line for drawing. This is a scan from my blank-page Moleskine. I LOVE the weight and smoothness of the paper. Highly recommended.